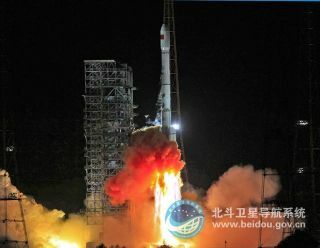 China launched a Long March 3B rocket carrying two new Beidou navigation satellites for the country's global positioning satellite constellation on Tuesday, Sept. Sept 18, 2012, from the Xichang Space Center. Two satellites for China's Beidou navigation system lifted off on top of a Long March rocket Tuesday (Sept. 18), adding new spacecraft to the growing network to provide more accurate positioning services to military and civil users. The satellites launched on a Long March 3B rocketat 1910 GMT (3:10 p.m. EDT) from the Xichang space center, a facility in Sichuan province in southwest China, according to a release from the China Academy of Launch Vehicle Technology, the state-owned contractor for Chinese rockets. Chinese government agencies declared the launch a success, marking China's 12th space launchof the year and the 50th mission worldwide to reach orbit in 2012. The satellites launched Tuesday are the 14th and 15th Beidou spacecraftin the program.